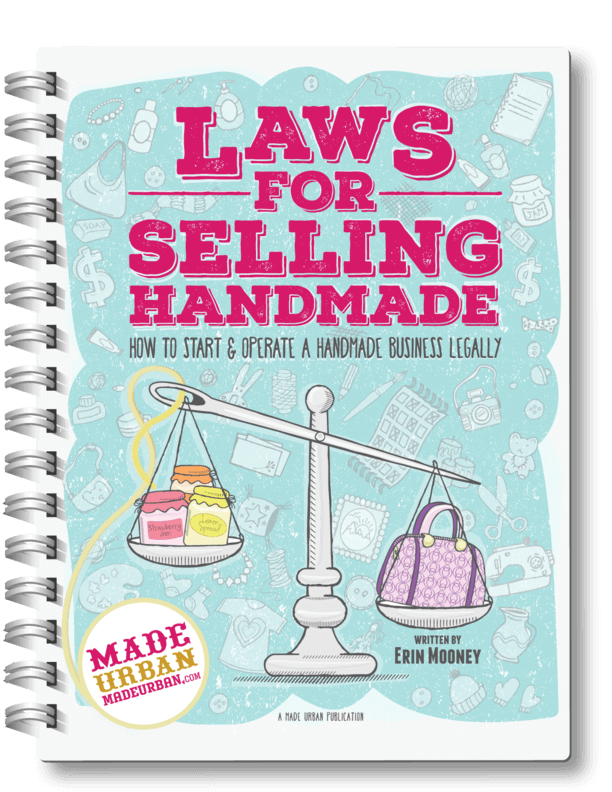 You design your handmade products, build up tons of stock, set up at a craft show and wonder if your products will sell. The hard part is; you’ll never know 100% what people will and won’t buy until you put it out there. But….you can increase your chances of creating a handmade product that sells and save costs along the way by doing research and working off facts, not guesses. Let’s assume you’re in the dream up stage of your new product. You have an idea, have figured out several details but haven’t actually begun making any. You’re in the safe zone right now; not a lot of money has been put into this new product idea and you have very little risk at this point. Free worksheets included, download them at the bottom of the article. Every great product solves some sort of a problem or feeds a passion. Which problem is your new product solving and how is it making your customers’ lives better? If someone has already purchased from you, why do they need this new product? Think of a passion as almost an obsession of your customers’. They spend their time discussing, reading or asking questions about the topic. It may be a certain style of fashion, skiing, cats, saving the environment, etc. If you really can’t think of a problem your new product solves or a passion it appeals to, you may want to go back to the drawing board. Think about the problem you wish your products would solve or take a trip to your customer’s mind for a second. What do they wish your products would solve? Imagine they were to say “If only there were _________ (your category of product) that did ________.” Fill in that blank. What’s your customers’ dream solution? Or consider the Facebook groups your customer joins or the pages they follow. What about the magazines and blogs they read? Or the events they attend. Exploring your customer’s interests outside of the products they buy may help you find a passion. Once you find that passion, you can work your products into it. There’s a reason behind every purchase so determine what will be the driving reason for your customers and how to highlight that. If you’ve already built a customer base, get to know them a little better by doing some digging. 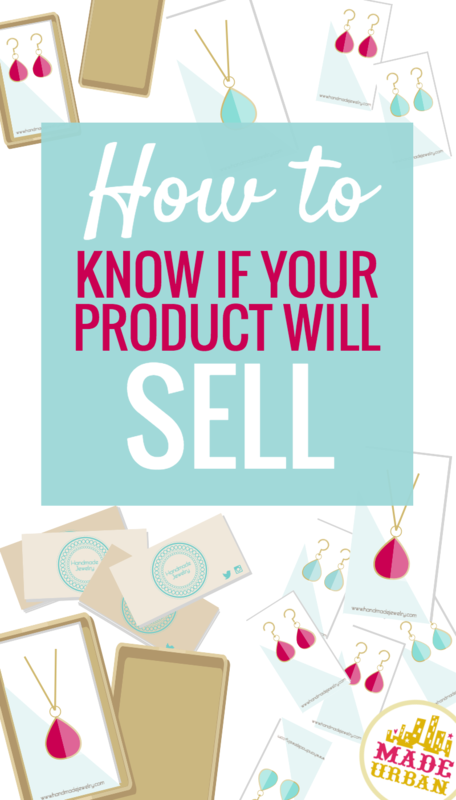 You’ll likely be promoting your new handmade products to them, or people similar to them, so they’re a great source of knowledge. Google Analytics – which product pages are visited the most on your site? How long do visitors spend on those pages? Longer times may indicate they’re interested in the details and are taking time to click through photos and read descriptions. Social media stats – which posts tend to get the most likes, comments and clicks? These may be an indication that your audience wants to see more of the same. Sales – which product(s) did you sell the most of in past months? If there are several top sellers, look for commonalities. Do your popular products all have the same color, style or function? Numbers are the safest to work from. They tell the truth and aren’t persuaded by emotion. Sometimes you have to follow your gut but the more you can factor in evidence, the greater chances that “gut feeling” will be spot on. If you currently have a list of emails for your newsletter, send one out asking your subscribers if they’d be interested in providing you with some feedback. The key is to consider what exactly you want to know about the product and ask specific questions to draw those answers out of people. Simply sending a photo of a new product and asking if people like it, doesn’t do you much good. Get them to be subjective and get their opinions. Ask questions that can’t be answered with a “yes” or “no”. You could ask: what colors would you prefer to see this in? What type of details do you look for when purchasing a product like this? What objections might you have to buying this product? People are busy so keep it short and simple. I love typform for gathering answers. Use their free version, add your branding and analyze your results in one spot. You could even sweeten the pot by offering something to those who do respond. Perhaps a coupon code they can use on a future purchase would encourage more people to reply. Go to Google’s Keyword Planner enter a few keywords and see the amount of searches there are for your search term each month. The ideal keyword combination will have high search results and low competition. Meaning lots of people are searching for that product but there aren’t a lot of businesses advertising it. Competition may not always be low but your keyword should have a decent search volume. It may even spark some new ideas and move your product in a new direction. If you search the term “scarf” using Google’s Keyword Planner tool and it shows you there are 1 million – 10 million searches for scarves each month, you’re sitting pretty. Now check the specific terms people search with “scarf”. You may notice that “headscarf” has a high search volume and “medium” competition. This may influence you to move your scarf in that direction instead of creating a “mustard coloured infinity scarf” which has low searches and high competition (actual stat from Google Keyword Planner). Remember, we’re in the “dream up” stage and haven’t started anything major yet (like creating 100 of the product). Changes are cheap at this point and can save you and make you more money in the long run so take the time to get it right. You may already have that proof through existing customers. But if you’re targeting a new group of people to expand your reach, do some research and make sure they’re easily found so you can sell to them. Where would you place an ad to reach your target market? Who might write an article on your new product? Are there blogs, magazines, newspapers or TV segments focused on reaching your target market? Where does your audience go when they want to find information on products such as yours? Are there forums where people gather to discuss common problems and find solutions? Are there Facebook groups or people who gather offline to discuss, buy and sell your type of product? Where do people shop, online and off to find a product such as yours? Are there websites or brick and mortar boutiques who target your customers and may be interested in carrying your product? If you’ve gone too narrow with your niche market, you could have a hard time finding ways to reach them through marketing. You can always build your own audience and reach a very specific niche of people through social media and word of mouth. But keep in mind; it takes much longer to do it on your own than make use of existing marketing channels that lead to your audience. You’ve already got the concept for your new product so this isn’t to see what competitors are doing and alter your design. It’s to try and find something similar to what you want to sell and check stats to see the popularity of it. Etsy is a good place to look since they can show how many sales a vendor has made and how long they’ve been selling through the platform. Enter your product name into the search bar at the top of Etsy and click Search. Look for reviews on the specific product. The more that show up, the more sales that product received. Keep in mind, not everyone who buys writes a review. So if there are lots of reviews for a particular product, it likely means there were even more sales. And if there are no reviews, it doesn’t necessarily mean there have been no sales. Read what people specifically loved about their product. Again, you’re not looking to copy their product, but simply notice the features people appreciate when shopping for your item. Note whether reviews were high, if they were good, bad or great and any specific mentions of liked/disliked features. This will tell you how many people have shown an interest in that product. A favorite doesn’t necessarily mean a purchase but it indicates interest which is always a good start. Note whether there are many favourites or very few. Head to their shop and check number of sales (if displayed) and “On Etsy Since”. High number of sales over a short period of time is a good indication of a popular product. Note if sales are high or low for the amount of time the seller has been on Etsy. Photography – photos should look professional and show details shoppers are interested in. Titles & descriptions – titles should not be so specific no one would ever search the keywords (“Light gold bag with green, blue and purple stripes and polka dots”) or too vague (“Karen Handbag” – might be how you identify the style of purse because it suits your friend Karen perfectly. But almost no one searches for a “Karen” bag, unless they know exactly what they’re looking for). Titles should use keywords people would actually enter into the search bar when shopping. The description should give enough details about the product that shoppers know everything they need in order to purchase. Pricing – too low and it will turn shoppers off and make them wonder why their products are priced so much lower than others. Too high, without explaining why, will also drive shoppers away. If their products don’t have these elements right, that could be the reason for lower favourites, reviews and why the handmade product didn’t sell. Keep in mind; if your products don’t follow the above tips either, you run the same risk of low sales. Instead of creating a ton of stock, create one prototype. Make it look awesome, photograph it well and put it out there. Post it to your website, social media pages and display your prototype at your next craft show or event. Make product as orders come in and reduce the risk. If turnaround time is quick, simply take orders as usual, as long as you’re able to keep up with them. On the other hand, if it’ll take a few days to create the product after it’s ordered, make that clear to shoppers and state the time between order and shipment. Bring your prototype to craft shows and use it as “display only” while accepting orders. You’ll want to try and offer free shipping since craft show shoppers aren’t expecting shipping charges when they visit the event. But you can build some of that cost into the price or it may be worth it to take on those costs as part of your research. 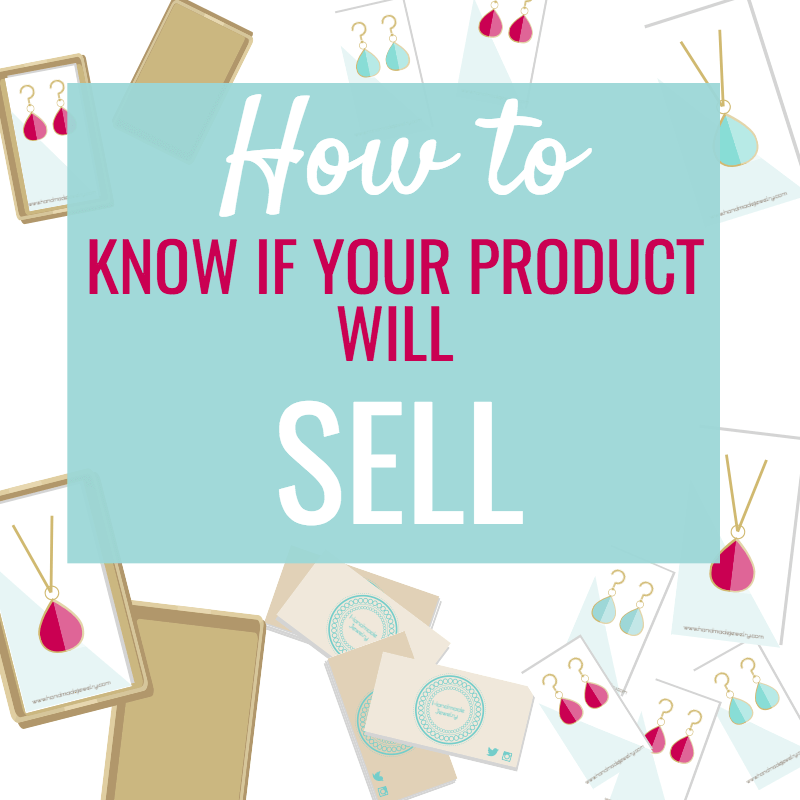 Stay in this test phase for as long as you feel is needed to prove whether your handmade product will sell or not. Making an item one at a time does consume more production hours than creating product in bulk. But you’ll save time and money by not having to spend it on materials and production that you may or may not see a return on. If you want more info on creating products that sell themselves and require very little marketing efforts or you’d like more details on how to find your audience, download THE SUCCESSFUL INTROVERT.